A fellow HAM came to me and asked for a simple circuit to monitor battery voltage and activate an indicator when the battery voltage falls below a prescribed level. So the challenge was to build something that was simple but effective for indicating that the battery voltage was above a threshold or not. The solution here uses five passive components and no additional power sources. Four of the components are in a bridge arrangement with the fifth component an LED across the bridge as the detector. The bridge circuit is illustrated below. Each half of the bridge has one resistor and one Zener diode. The resistor provides bias current to the Zener diode. One Zener diode is connected to ground and provides a reference voltage above ground. The other Zener diode is connected to the battery high side providing a reference below the battery high side. When an LED is placed between the two Zener diodes, the LED will conduct current when the difference between the two Zener diodes is greater than the Zener forward bias voltage, which is 1.7 volts for some LEDs. The equation for when the LED will forward conduct is as follows: if Vbat < Vz1 + Vz2 – 1.7, then the LED will be forward biased and will conduct and illuminate. For an LED to indicate a low voltage at 10 volts a Zener pair of 5 volts and 6.7 volts will work with a Zener diode with a 1.7 volt forward voltage drop. A Zener pair of 3.9 volts and 8.2 volts with provide an indication of a voltage below 10.4 volts. The LED is the brightest when the voltage is just below the threshold and will dim as the battery voltage decreases from there. The value of the bias resistors and the properties of the LED will determine how bright the LED will be when conducting. A “bright” low current LED works well with two 1500 ohm bias resistors. If the Vbat is to get large, then the LED could be put in series with a diode with a sufficiently high reverse bias voltage to protect the LED. 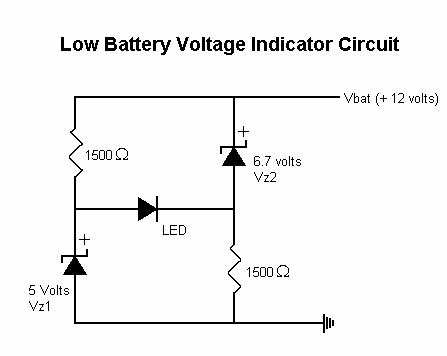 If the LED voltage to be used is other than 1.7 volts, then adjust the above equation accordingly.